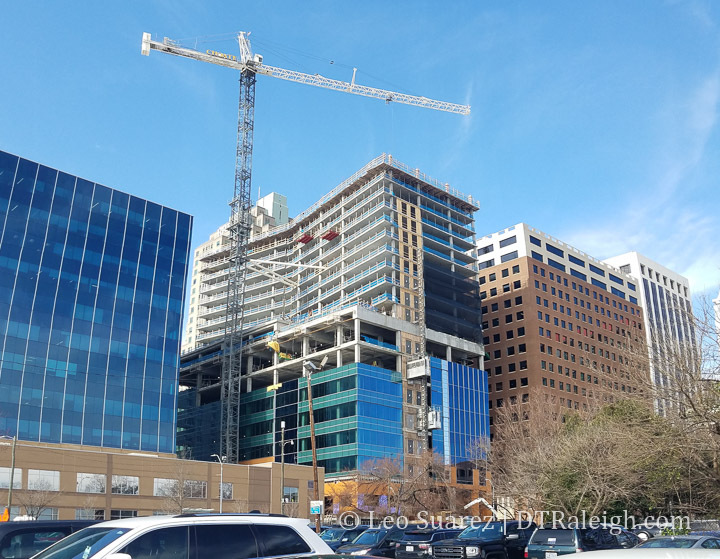 The FNB Tower continues to rise along Fayetteville Street. The Wilmington Street side has a nice dramatic view from the southeast as seen above. The mixed-use tower will bring over 200 apartments to an area that’s more dominated by 9-to-5ers than anything else so it’s nice to see that mix. FNB Tower is also the last new development to take place on Fayetteville Street without demolition. I’m hoping this brings eyes to the southern end of Fayetteville where two lonely surface parking lots, zoned for a maximum of 40-story buildings, sit completely under-valued. Let’s get Fayetteville Street extended one more block!